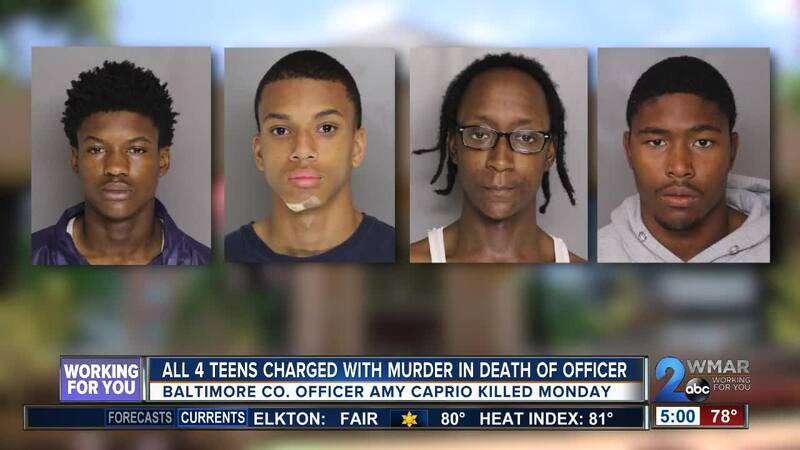 All four teenagers that were reportedly involved in the murder of Officer Amy Caprio have been identified and charged as adults. Eugene Genius IV, 17, Darrell Ward, 15, Derrick Matthews, 16, and Dawnta Harris, 16, are all being charged with first-degree murder after Baltimore County Police officer, Amy Caprio, was run over by a car and killed on Monday. Genius, Ward, and Matthews are also facing first-degree burglary charges as well. On Monday, the teenagers were allegedly breaking into homes in the Perry Hall area when Officer Caprio responded. Genius, Ward, and Matthews were reportedly inside a home on Linwen Way when Officer Caprio arrived. Harris was waiting in a Jeep Wrangler, and when Officer Caprio told him to get out of the car he allegedly ran her over and then drove away. After a multi-day manhunt, all four teenagers are in police custody. Harris was arrested on Monday and the other three were all caught on Tuesday. Genius was arrested at a home on the 33rd Street in Baltimore City at 8:40 a.m., Matthews was arrested at a home in the 1800 block of E. 29th Street in Baltimore City at 8:53 a.m., and Ward was arrested at his home on Ashland Avenue in Baltimore City at 9:31 a.m. According to charging documents, Genius was arrested a day after the murder occurred and objected to his murder charges, saying that he was in the house when the murder happened. He added that he only knew two of the others involved, not all three. During a pre-trial hearing, Genius denied a public defender and said he is using private attorney Derrick G. Hamlin. His bail review was postponed because his attorney did not show up. Matthews is being represented by a public defender and was denied bond. According to the state, he was arrested for a crime related to a motor vehicle in March of this year and was under house arrest. Ward had a private attorney and waived his bail review. He was also denied bond. Harris is being represented by Warren Brown and was denied bond on Tuesday. They all have a trial date of June 1.